Senge Dongma (Tib. སེང་གེ་གདོང་མ་, Wyl. seng ge gdong ma; Skt. Siṃhamukhā or Siṃhavaktrā) — the lion-faced dakini. 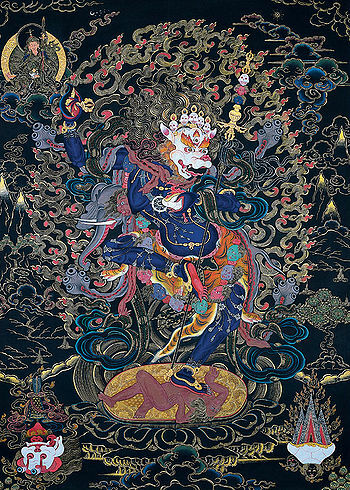 In the Nyingma terma tradition, she is considered as one of the many forms of Padmasambhava, specifically a secret form of Guru Rinpoche manifested to avert spiritual obstacles and negativity. In the Sarma traditions she arises out of the Chakrasamvara cycle of tantras and belongs to the Anuttarayoga 'wisdom' classification. ↑ Sometimes rendered as: Singhamukha. ↑ Philippe Cornu, Dictionnaire Encyclopédique du Bouddhisme, p. 534. This page was last edited on 19 December 2018, at 11:57.